Woolies was once an integral part of Margate’s town centre and its closure a decade ago symbolised the decline of the High Street. 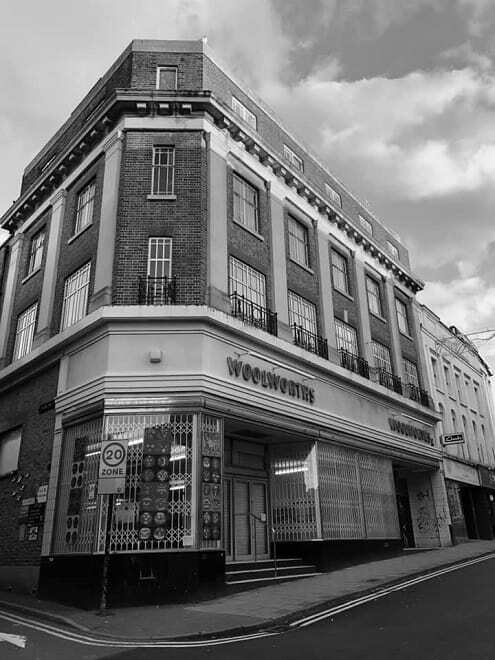 The store was purpose built at the corner of New Street for Woolworths in 1925 and traded its eclectic blend of pick ‘ n’ mix, records and then CDs and assorted items until the chain collapsed at the end of 2008. But now the building is set to once again play a role in revitalising the area with plans for a cafe, exhibitions and co-working spaces on the ground floor. The Margate School, who secured £499,000 from the Coastal Communities Fund in September, is currently renovating several floors of the former shop. Uwe Derksen, school director, says they hope to lease the building from current owner Nick Conington who bought the building for £2million. 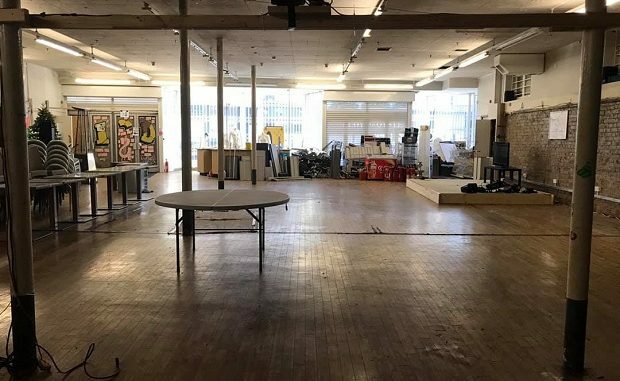 “The ground floor will be for exhibitions and we have the first opening in September by Christopher Alexander who previously exhibited at Turner Contemporary,” he said. Born in Margate, Christopher Alexander (1926 – 1982) was trained at the Royal College of Art after the Second World War, returning to Thanet in 1951 to teach figure drawing at Thanet School of Art and later Canterbury College of Art. He was a prolific artist and produced a huge number of drawings, paintings and prints including many of the local landscape and people. The Margate School is also looking to offer technical support for creative industries with short courses; a Fine Art MA is set to start in the new academic year. The school recently held an open day at the Woolworth’s site setting out their plans for the county’s first FabLab: a technical studio that specialises in 3D printing and computer-aided design. Other sites are also being explored in a bid to bolster the provision which is intended to compliment Margate’s burgeoning creative industries. Oh dear sounds like another pick and mix of no hopers. If high street shops sold goods shoppers wanted then they could be resurrected from the ashes left behind from the out of town retail parks. Charity shops / bettering shops Estate agents should be BANNED from the high streets. They should be in the other streets. Couldn’t agree with you more! Spot on. If High Street shops sold goods that shoppers actually wanted, they would go!! And yes,estate agents & betting shops should be in the side streets. Good idea. I think this is brilliant news, the art scene in Margate is thriving and is certainly bringing in the tourists and the Woolworths building has been empty too long. The way we all shop has changed over the last 20 years and therefore traditional high streets must do likewise and evolve. Surely seeing these old empty shops and fine buildings become places of varied interest for all, such as arts & crafts- community hubs- hotels -and all manner of artisan cafes and bakeries- gift shops- micro pubs and wine bars – retro shops etc. Whilst still enabling charitable businesses to nestle in amongst all this seems to be a perfect solution. As some of the out of town shopping centres large retailers are in meltdown sites like that should be offered to companies first how many galleries and cafes do we need in the high Street.these company’s might want to downsize.into the high street. Good idea Brian. It’s great to see Margare becoming an art centre but it won’t sustain the town in the long term and it needs to have a mix that creates jobs for the majority most of whom are not artist. Looks like the spelling and grammar department at your school was underfunded Rogers! Joking aside I think this is great news, bringing students to the town will help to continue Margate’s regeneration. People are so negative on here! And so short sighted – this isn’t just for professional artists. It will bring students to the area, contribute to increasing tourism, attract academics and designers – it will benefit children and young people in the area who will be empowered to learn new skills, and it could benefit businesses who might be able to use the lab for their own projects or who will have increased trade in the high street. The comments on here are so down in the dumps and reflect a community lacking in creativity, imagination and optimism. The High street is in desperate need of regeneration so how about we get behind new ideas instead of slating them before they get off the ground? Well done Toni, it’s hard here to listen to the negativity of folk who do nothing to enhance or support Margate but your comments are spot on! Exactly, the high streets need to adapt and offer more than shops, I look forward to this empty space coming back into use. Wilkos would be great to have here. Patricia to small .i did speak to head wilko office .we have a store at WWX & Ramsgate . Yep, like many above I think it is better to leave the High Street semi derelict. Can’t we close down more of these space wasters and createore doorways for the homeless to sleep in? Back in the old days churches and scout huts used to have jumble sales, then these got moved into fields, where people sold their junk on a Sunday morning known as a boot sale.. Now all this rubbish is being sold in shops. Great for hippies who like scribble on canvas old jeans an LPs. Dave, remember the cuts now affecting you the next time you’re about to tick the box at the ballot, both KCC and the Government are Tory run. I agree with rob as former chair of a passenger forum public transport is run by private companys councils of all political colours done nothing about it.people need to campaign against the bus company. The money for the Woolworths building came from other sources.money from this cannot be used for public transport.i would that her see a much needed store to help that end of the high street. We still have the empty primark building that the same owners of Woolworths.another store is what is required.